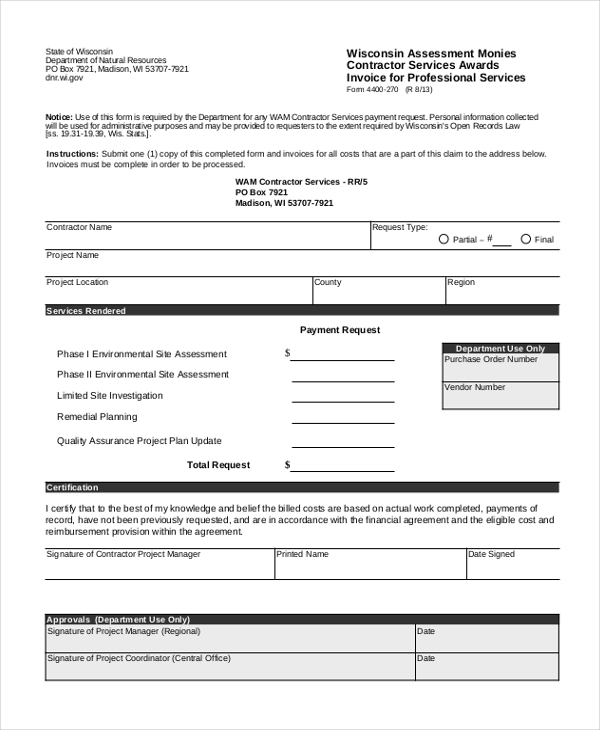 A contractor who offers his services to a client uses a contractor invoice form to post a claim for the amount that the client is liable to pay in lieu of the services. The contractor uses the form to elaborate on the services offered by him along with any other expenses he may have incurred during the process. Using the form makes it easier for both the contractor and the client to close the transaction. 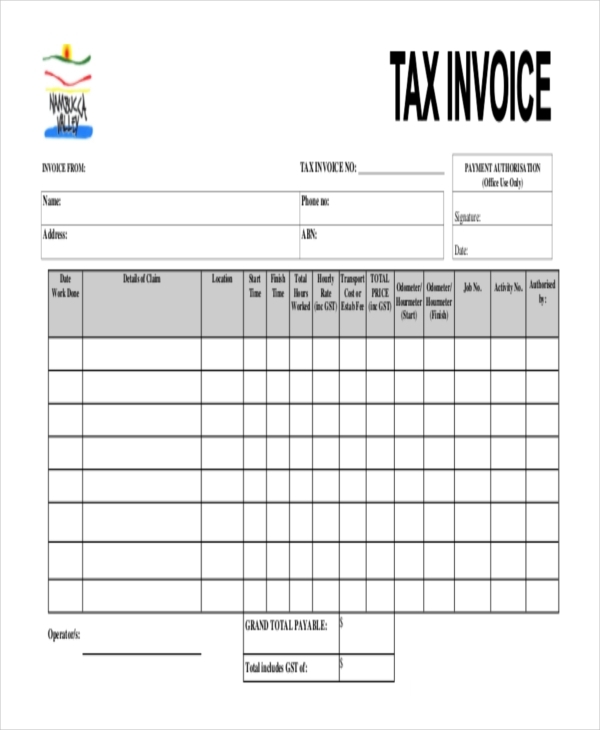 You may also see Sample Invoice Forms. 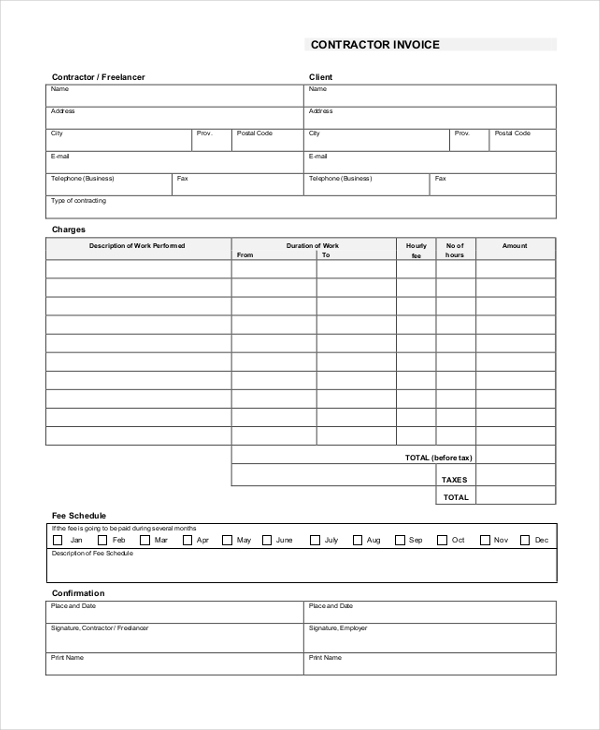 This form is used by a contractor to design a billing invoice that would help him to offer a bill to his customer charging the person for the services offered. A contractor can use this template to design a tax invoice that will help him to declare the details of his annual income with the taxation department. A contractor who needs to claim the amount for the services rendered by him, on a weekly basis, he can use this template to design a perfect invoice. 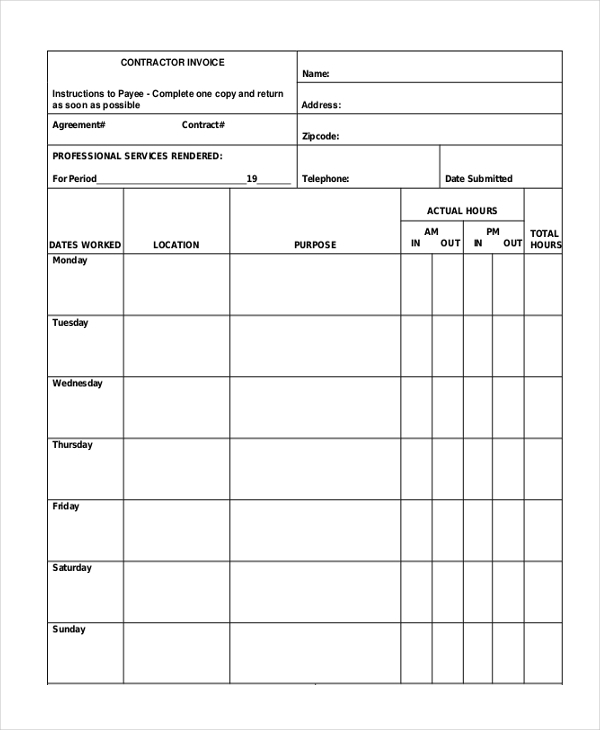 This blank contractor invoice gives an idea of the format that should be followed when designing a contractor proposal form. It comprises of all the important segments. An electrical contractor who offers his services to customers can make use of this invoice to raise a claim for the amount that his customers need to pay. An independent contractor can customize this invoice and use it to inform his clients of the amount that they are liable to pay for the services rendered by him. As the name indicates, this invoice helps an IT contractor to elaborate on the services offered by him and raise a claim for the amount payable. 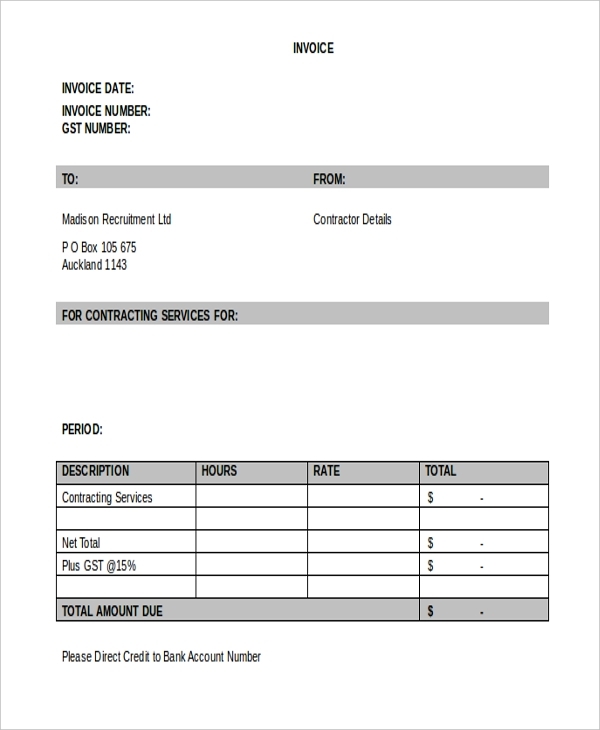 A contractor offering plumbing services to customers uses this invoice to claim the payment for the services as well as additional expenses rendered by him. 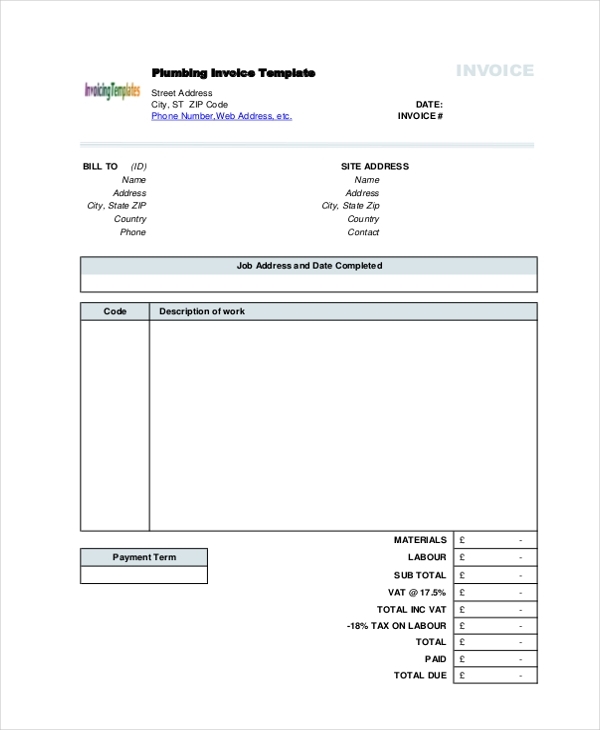 A contractor who is paid by a client on an hourly basis uses this template to design an invoice that would make it easy for him to list down all the details in an orderly fashion. What are the Benefits of Using Contractor Invoice Forms? 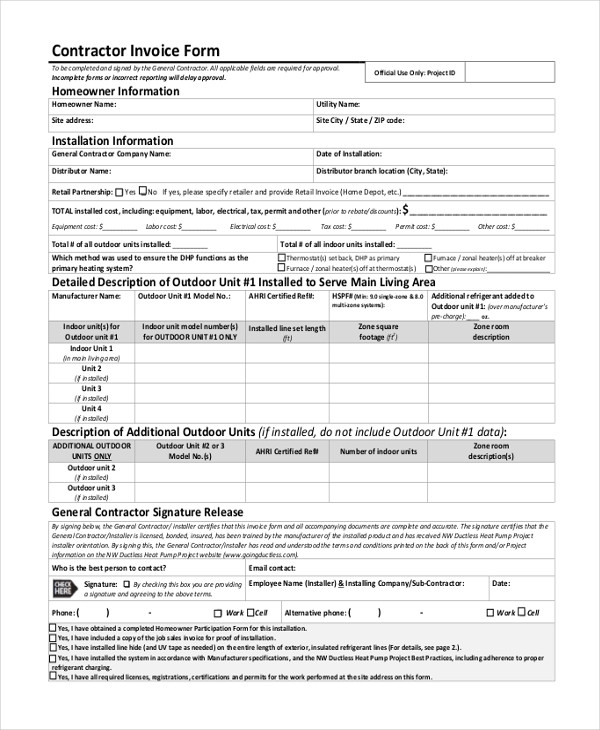 How to Format Contractor Invoice Forms? Start with your name or the name of your company and contact details. Follow this up with a segment where you can fill in all the details of the client. Below this add-on a segment to list down the details of the services rendered along with the rates. Putting this in a tabular form would be a great idea. In the end, leave out some space for your signature and seal along with the invoice date. 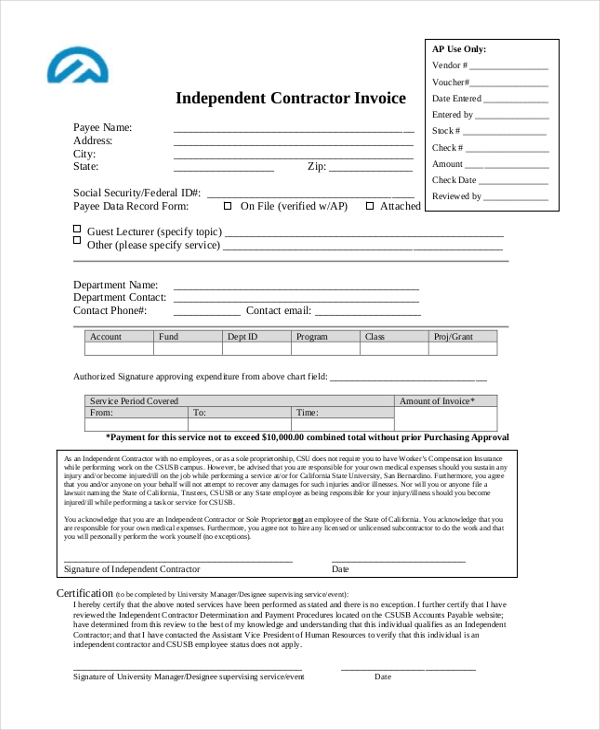 You may also see Independent Contractor Forms. 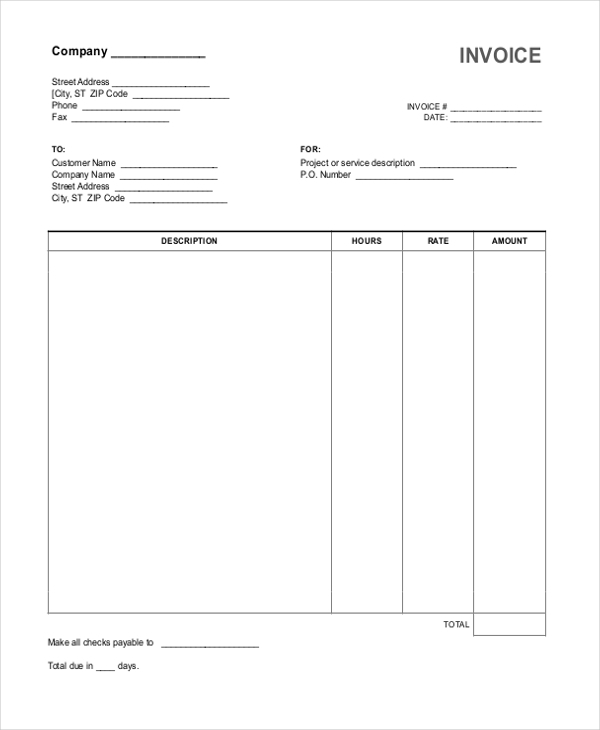 If you are not sure how to design a contractor invoice form, fret not! Look for the perfect form from our vast collection. These are available in MS Word and PDF format and can be easily downloaded. You can conveniently make required changes to the template before printing it. You can also see Contractor Proposal Forms.